Aviation Search Group can help you get started by generating a list of candidates for a position. We will review the position with you to identify the target market and provide an estimate of time to generate a pool of candidates. We then put our research group to work for you and simply deliver a list of candidate names and contact information. If you are a hiring aviation company seeking a source to search aviation resumes and find job seekers, consider using www.jsfirm.com. They have an extensive aviation resume database that includes pilot resumes, avionics technician resumes, aircraft maintenance technician resumes, sheetmetal technician resumes, aircraft dispatcher resumes, aviation executive resumes, mid-level aviation management resumes, aviation sales resumes, flight attendant resumes, paint and interior technician resumes, etc. Call 724-547-6203 for more information. Building an aviation resume is the single most important item in your job search. There are countless websites, some free and some fee-based, that offer resume building techniques, advice and tips. Your computer will have basic software that will enable you to begin a resume, as well. 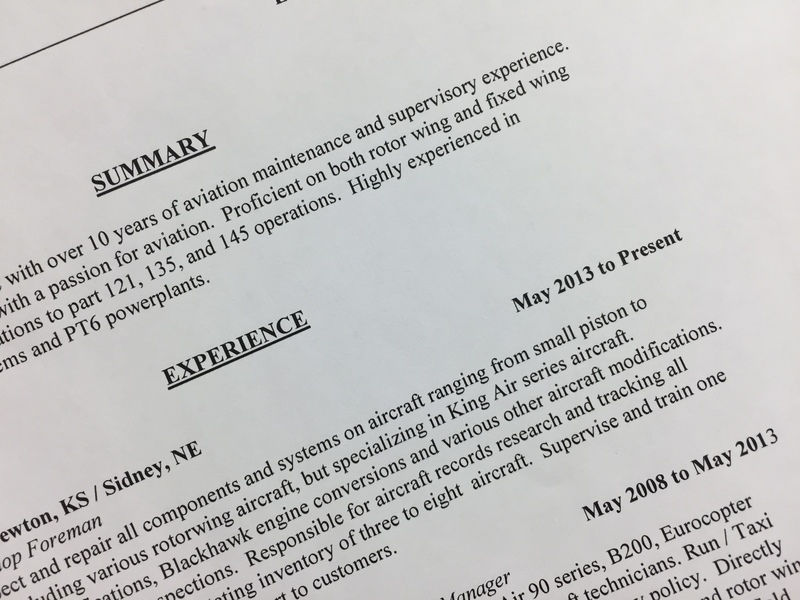 Your resume advertises your qualifications, and it is important to create a winning advertisement that is certain to catch the eye of an aviation employer; there is a technique for creating aviation resumes for technicians. Companies use websites to mine aviation resumes. These sites have Boolean or keyword searching capabilities. This means that employers may search the resume database using terms such as “Avionics and Garmin,” or even more complicated searches such as “(Avionics or Technician) and (Garmin 530 or garmin530 or g530 or g-530) and (Citation7 or citation 7).” Make sure your resume is written in such a way that your experience is encompassed by these key terms. If you need help creating an aviation resume, we recommend speaking with JSfirm.com at 724-547-6203. They specialize in developing aviation-specific resumes for aviation technicians and executive job seekers.